Numbers can be powerfully persuasive, as we can see from the most recent Pending Home Sales Index from the National Association of REALTORS® (NAR). This month's report from the NAR is very bright and cheery, and it points to an amazing run of year over year gains. But when we put the NAR numbers to a graph, it is hard to discover the cause for their exuberance. pending home sales are at the highest level since March 2007 when the index also reached 104.8. On a year-over-year basis, pending home sales have risen for 18 consecutive months. When I graph the NAR data however, I find a rather underwhelming picture. 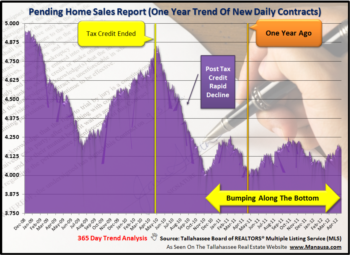 The real estate graph above has data going back to April 2010 (when sales were artificially stimulated by the Homebuyer Tax Credit). As you can see, the market has not even returned to the contract level of 2010, and there are reasons beyond buyer consumption to expect our numbers to be much higher. Short sales have a higher fall-out rate than do traditional "arms length" sales, so it is expected that our contract activity will increase, even if sales stay flat. That's right, much of the rise in the PHSI is purely due to the higher fall-out ratio produced from an increase is distressed properties for sale. Pending home sales in the South rose 5.5 percent to an index of 117.3 in October and are 17.4 percent higher than a year ago. The graph does show a healthy rise, but like the US figures, we are still below the April 2010 level of activity. 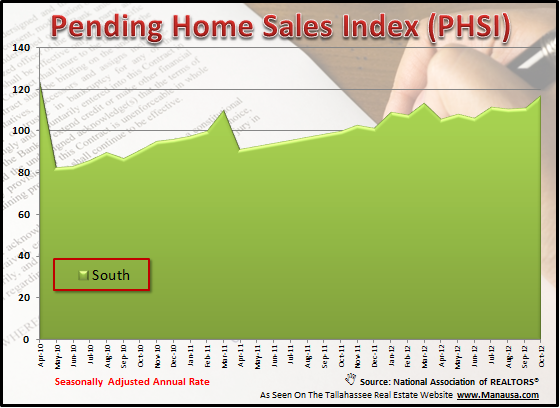 The NAR report does not drill down to the Tallahassee real estate market, but fortunately we track that here :). 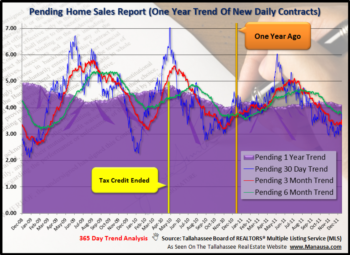 And unlike NAR which uses 20% of the data to produce their estimated reports, our graph uses 100% of the new contract data from the Tallahassee MLS. 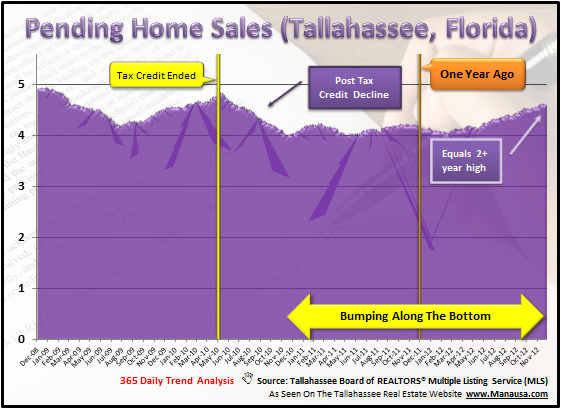 Tallahassee's information is consistent with the rest of the South, rising nicely over the past year but still well below where we have been in the past. The real question is how much of this rise is due to short sales and foreclosures that will not close (often times, these properties report multiple buyers, but only one can close). Activity is rising among buyers, and so long as interest rates remain at these crazy low levels, I think we can expect continued improvement in the number of new contracts being written each month. Hopefully, we will see this transfer over to more closed home sales as well. If you would like to know how the most current trends in pending home sales impact your ability to sell a home, just drop me a note and we can schedule a time to address your unique and specific situation. Joe - if I understand your argument, NAR is using contract data, as opposed to sales data to make their case for the rosy real estate picture? Why doesn't NAR use sales data? If sales are used with the Tallahassee data, what do we look like? Thanks Eva. They do use sales data. But in a separate report. 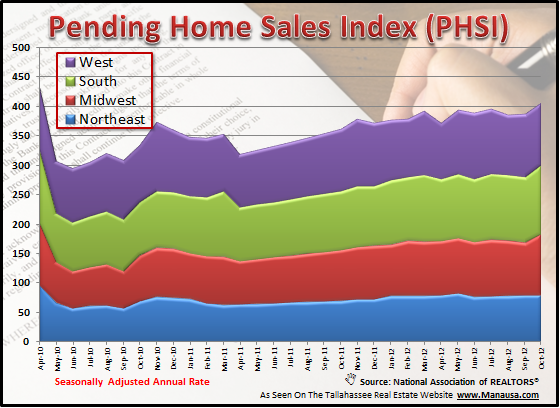 You can see the corresponding sales data in the recent Tallahassee Home Sales Report. Yeah Connor, I agree that leadership is missing from the "leadship" at NAR. NAR is always painting a rosy picture of home sales. Even in the depths of the depression, er, I mean recession they were shouting, "Now is the time to buy." It became so ubiquitous that it was like the white noise people use to go to sleep. NAR, unfortunately, is clueless about a lot of stuff. They're good at collecting money (through dues), investing money (in commercial real estate in Chicago) and lobbying Congress. My biggest issue with NAR is that they believe that the membership will march lockstep behind whatever banner they raise. It's insane. The numbers juggling is just another example. Thanks Ken. I wish we could get them to fill a useful capacity. They have data that would really help us project into the future. The numbers are a flat out lie. Remortgaging a old loan is NOT a new sale. Beating on elderly people doors to get them to take out home equity loans on a paid off house is NOT a new sale. God only knows what else these scumbag bankers are doing to boost numbers. The banks were involved in the 2008 housing scandal and now they are creating a new one with fictitious sales numbers.